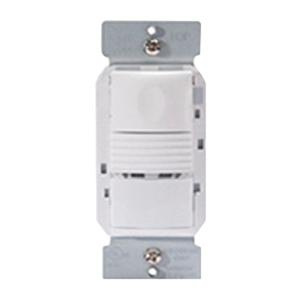 Wattstopper Occupancy sensor in white color, features passive infrared technology. It has sensing distance of 35-ft x 30-ft for major motion and 20-ft x 15-ft for minor motion. Sensor requires 120/277-Volt AC voltage for operation. It is suitable for small office, small conference room, lunch/break rooms and individual restrooms. This sensor has response time of 5 - 30 mins. Sensor measures 2.73-Inch x 1.76-Inch x 1.83-Inch. It features high sensitivity and dense coverage to ensure better performance. This sensor has pushbutton dimming control and optional locked preset level. Sensor comes with color matched lens and low-profile for appealing design. Detection signature processing feature of this sensor eliminates false triggers and offers immunity to RFI and EMI. Sensor in test mode offers quick as well as easy adjustments. It has zero-crossing to ensure long relay life. Selectable operation, walk-through, test and presentation modes of this sensor ensure better energy savings. It is wall mount mounted at height of 4 ft. Sensor is UL/cUL listed and meets NEMA standards.